GM 3100 service manual, and our classroom text book were used. Lab notes and internet were used for some of the notes. 1. List all the steps needed to measure cylinder taper and out of round. the bore gauge was placed in this unit and calibrated using the micrometre scale on the unit. To calibrate for specific bore, use the standards. For example, for 4.406 bore, install 4.000+ standard and set the scale to 0.406. Bore gauge is calibrated until the dial shows 0 on it. Or more adjustment should be done. the bore gauge was then placed inside the cylinder at Top thrust surface and rock the bore gauge front and back until dial goes up and comes back. Note the highest reading, the dial reaches. Do same for bottom thrust surface. To measure the cylinder out of round, measure top thrust surface of the cylinder but perpendicular to the first measured. Now compare both reading for top thrust surfaces readings. If the difference between the measured reading is more than 0.0005 then the cylinder is out of round or else, it is good. To measure the taper, subtract the reading of bottom thrust surface from top thrust surface. If the reading is more than 0.0008 then cylinder is not good. Cylinder out of Round is the difference of diameter when measured parallel to crankshaft and then perpendicular to the same at top of the cylinder using bore gauge. 2. 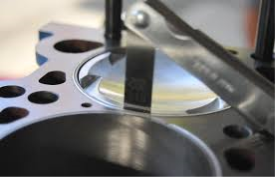 Document 2 methods of measuring piston to cylinder bore clearance. Invert the piston and place it back in the cylinder in upside down position with feeler strip. The feeler strip should not be on the piston pin hole. After piston is placed in the cylinder slowly take the filler gauge out. While taking the filler gauge out, if it feels too hard or loose the try different size of the gauge until you get the perfect size. The perfect size of filler gauge should not feel too tight or smooth while taking it out. 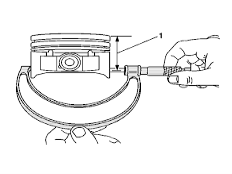 Measure the diameter of the piston across the skirt with well calibrated micrometre. Note the reading. Now using the bore gauge measure the cylinder diameter under the ridge. Record the reading. Now subtract the piston diameter from cylinder diameter. 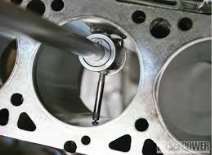 The measurement achieved is the piston to cylinder clearance. Note that before taking any reading the micrometre should be well calibrated and the surfaces should be cleaned. 3. Construct a chart listing cylinder, piston ring and crankshaft clearances. 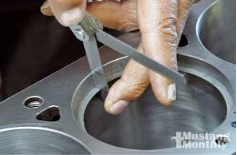 Clean the piston ring groove before measuring. For measuring the ring clearance, the ring doesn’t need to be installed in the piston. Gently place the ring in the groove. After placing the ring measure the clearance with the help of feeler gauge between the ring and upper edge of the groove. Compare the measured ring clearance with the manufacturers specification. If the measured clearance is more then the manufacturers specification the change the ring. Place the ring in the same cylinder from which piston come out. Using the piston slowly push the ring in the cylinder. Then measure the gap between the two ends of the rings with filler strip. The filler strip should not too hard or too smooth to pass between the two ends of the rings. Then do same for the second ring and note the measurement. Compare this measurement with the manufacturers specification. If the measured end gap is more then the actual specification the change the ring. 5. Describe 2 methods of measuring crankshaft bearing clearance. remove the main bearing caps from the block and clean the surface of the crankshaft journals with a clean rag. Now place a piece of plastigauge according to the width of the journal. Install back main bearing caps on their same position as before. Check that the bearings are in the correct direction. Install the bolts and tighten them with torque wrench at the manufacturers specification. Now remove the main bearing caps and check the spread of plastigauge. Compare with the marking given on the cover of the plastigauge and note the reading. Now compare this reading with the actual specification. Before installing main bearings back, carefully wipe the plastigauge marks. Measure the crankshaft journal diameter using a well calibrated micrometre. Measure every journal two times both perpendicular at each other. Note every reading. Now put the bearing journals back on. Use torque wrench to tight the bearings with specified torque. Using inside micrometre or bore dial gauge measure the diameter of the bearing. Note the reading. To measure bearing clearance, subtract the crankshaft journal diameter measurement from bearing journal diameter. 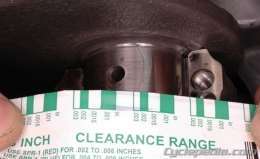 The allowable clearance for crankshaft is between 0.0008-0.0025. Cylinder Taper is caused by wear caused by friction and combustion cause the bore to be cone shaped. Cylinder Out of Round is caused by pressure created by piston rings to the cylinder walls. Upon completing the measurements and visual inspections, I would recommend that due to the excessive wear and out of round cylinder, the cylinder should be bored. While measuring the piston ring clearance we noticed that the piton rings were replaced and were both of same size on one piston. "Cylinder Taper and Cylinder Out of Round." UKEssays.com. 11 2018. All Answers Ltd. 04 2019 <https://www.ukessays.com/essays/mechanics/cylinder-taper-cylinder-round-7140.php?vref=1>. "Cylinder Taper and Cylinder Out of Round." All Answers Ltd. ukessays.com, November 2018. Web. 23 April 2019. <https://www.ukessays.com/essays/mechanics/cylinder-taper-cylinder-round-7140.php?vref=1>. UKEssays. November 2018. Cylinder Taper and Cylinder Out of Round. [online]. Available from: https://www.ukessays.com/essays/mechanics/cylinder-taper-cylinder-round-7140.php?vref=1 [Accessed 23 April 2019]. UKEssays. Cylinder Taper and Cylinder Out of Round [Internet]. November 2018. [Accessed 23 April 2019]; Available from: https://www.ukessays.com/essays/mechanics/cylinder-taper-cylinder-round-7140.php?vref=1.